Woven in wools and silks, depicting the Halte de la Chasse from a series depicting La Chasse, centrally woven with a group of mounted male and female hunters before a garden pavillion with revelling figures, with a peacock to the right side, contained within a cartouche and floral spray border, reduced in height and with a central rejoined seam later guard borders to top, bottom and right side, mounted on a wooden hanging pole. Léonard Roby the younger, marchand-fabricant of tapestries in Aubusson, was particularly concerned with the quality fo the designs for his tapestries when compared to those of his contemporaries in the Marche district. He is recorded as having purchased six pastoral paintings from François Boucher in 1760 and six years later another six paintings by Philips Wouwerman (1619-1668) and Carel van Falens (1683-1733) depicting hunting scenes. This tapestry was woven after the second group of paintings and was manufactued between 1766 and 1770 in his workshop. The series enjoyed success and was woven several times in a short period. Roby was one of nine principal marchand-fabricants in Aubusson under Louis XVI, who received commissions from marchands in Paris and distributed them to one of the 127 master weavers in Aubusson. 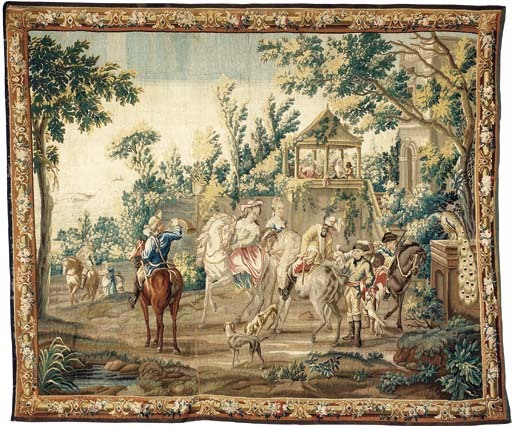 (Aubusson specialized in weaving fine tapestries during that period while Felletin produced coarser products). His tapestries are among the most accomplished Aubusson works distinguished by his selection fo particularly fine wools and silks and wide color ranges. A panel from the same series depicting Le Rendez-vous de Chasse with identical border and signed by Roby is illustrated in D. and P. Chevalier and P.F. Bertrand, Les Tapisseries d'Aubusson et de Felletin, Paris, 1988, p. 162.